Does anyone have any pictures or descriptions about the rank insignia of the german foreign ministry during the third reich? 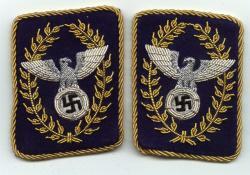 These insignia are for party officials, not for foreign ministry officials. 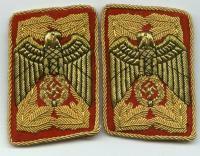 The 3rd Reich diplomatic insignias can be seen in the book "Badges and Insignia of the 3rd Reich" by Brian L.Davis. I have this book and can scan them and send to you. Can you send the picture of the diplomatic insignia to me. aditreeslime@yahoo.com thanks. with Italy's foreign minister count Ciano. Werner Best, German plenipotentiary in Denmark during the German occupation. The pictures are of senior officials in full dress uniforms, but the Auswärtiges Amt also wore grey everyday uniforms, and every level of officials from the lowest einfache Beamter to the Reichsaussenminister wore uniforms with rank insignia. PS. Dr. Best's rank insignia are the four stars worn on his lower sleeve. Could you direct me to where I can see all of the Foreign Ministry ranks, sleeve and shoulder boards with them all identified, besides the Forstbeamte, the Foreign Ministry is the hardest to find accurate information on. German Uniforms of the Third Reich 1933-1945 by Brian Davis and Pierre Turner. Foreign Minister, German Ambassador, Diplomatic officials and Eastern Territories Officials with a brief description of the uniforms. 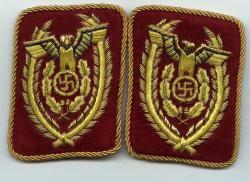 Davis and McGregor's book Badges & insignia of the Third Reich 1933 1945 has examples of Government Admin Officials sleeve badges. I have that book, however it does not explain what rank each illustration is, nor does it illustrate if the different sleeve insignias correspond with officer should boards per the military, and this is the information I am seeking and not finding. I believe covers in detail the uniforms & insignia of the German Diplomatic Service and Government officials, also the Occupied Territories. The book is not cheap, maybe it would be wise to order a copy at the library first, then decide if it answers the question. I couldn't find that book in any of my local libraries but I did find copy on Amazon in mint condition for under $40.00 USD, so I bought it. I haven't seen the book so I was a little cautious about it, hence the suggestion for the trip to the local library. The reviews however seem to rave aboout it, looks like a good deal. I haven't been on here for ages, however I can scan the pictures, is there anything in particular that you are looking for? Scans of any insignia of the foreign ministry and/or diplomatic services would be nice. Of course together with description.